Mr. Cheever is again pressuring Mr. Mooney to bring in new accounts at the bank. 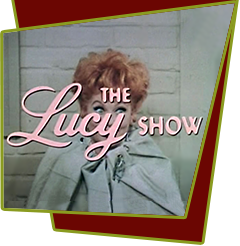 Lucy comes up with the idea of getting Jack Benny's business, but he is notorious for mistrusting financial institutions. Lucy tries to convince Jack Benny to take his money from his underground vault and deposit it in Mr. Mooney's bank. After convincing Benny to give her a chance, she demonstrates the bank's idea of a foolproof vault. She plans a design with even more elaborate precautions than Benny's own booby-trapped passages. The bank's new Benny vault is 300 feet down. It's equipped with land mines, a guillotine, knife-throwing wild Indians, a pool filled with piranas and snapping turtles, Irving the gorilla, and a pit of quicksand. Special Notes: Jack Benny, and some very expensive special effects, make this episode a classic. Script writer, Milt Josefsberg wrote for Benny for many years. This might as well have been an episode of Jack's own TV sitcom. The last scene, with Lucy and Benny sinking into the quicksand just before they get to the vault, almost doesn't happen. Benny is apprehensive about being able to stay on his feet, and Lucille has an attack of claustrophobia. However, both do the scene like the thorough professionals they are.